Much like Barbara Green, Catherine has had a direct association with the main factions behind the Highgate Vampire Case. However, her role with both, was much more in-depth and a compelling insight into working "behind the scenes". I interviewed her by e-mail (Saturday, 28 August 2010 5:41:30 PM) and her answers shortly followed (Saturday, 28 August 2010 9:05:10 PM). I've changed the numbering of my questions on this blog entry to our respective names and subsequent initialisation. However, the number form was retained in her post. Anthony Hogg: How did you first become interested in the Highgate Vampire Case? Catherine Fearnley: I first became interested in the Highgate Vampire case through a mutual friend who had met one of the key instigators at a fair. I was led to believe that he was a proper Bishop now and also the head of the Yorkshire Robin Hood Society, I soon became acquainted with the Bishop who in turn told me about David Farrant and The Highgate Vampire. To be fair on the Bishop he advised me not to have anything to do with Farrant as I would only be hurt in the long run, but I went my own sweet way and found out the hard way. AH: You previously served as a moderator on The Cross and the Stake. How did you obtain this post? CF: Technically this is not correct Anthony, not only was I the moderator, I was also the creator of this group, I started this group because I had an interest in the case anyway and I was aquainted with Bishop Manchester at the time. I also noticed that they did not have any discussion groups. I was advised by Bishop Manchester not to post up any of my own thoughts on here and to let the members ‘sort themselves out’ to this end I did only posting up general responses which Bishop Manchester gave to me at the time. AH: You were eventually expelled from this post. What were the reasons given? CF: Again, I was not expelled as such, I left of my own accord basically because I became involved with Farrant at the time. I was told it either had to be one side or the other I could not be party to both, so I went with Farrant, then Bishop Manchester and his group then started being hostile with me for no reason other then I had become involved with Farrant, it got so bad that I had started to take out an injunction against Bishop Manchester but had to drop this due to personal reasons. AH: Soon enough, you became the Secretary of the British Psychic and Occult Society, and the Highgate Vampire Society. How did you rise to this position? What tasks did you carry out? 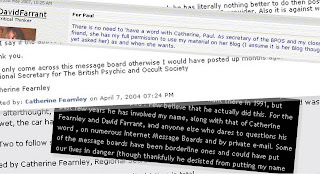 CF: Well as I’ve previously stated I became involved with Farrant, he didn’t have the use of a computer then as such only a word processor so it was easier for me to do the typing and organise membership cards, newsletters, etc and so forth. Also in and among Farrant asked me to make posts against Bishop Manchester which were of a derogatory nature so he wouldn’t have to put his name to them, all of this I now deeply regret no end. In fact I regret ever getting involved with them in the first place full stop. AH: You were eventually expelled from this role, too. How did this come about? I want to make this absolutely clear from the start that I am NOT involved with either party anymore, nor do I wish to be. I have my own life now and it is far removed from what I had back then. I’ve met nice people, made new friends, hopefully got myself a new partner, and have moved on. Pity others cannot do the same. 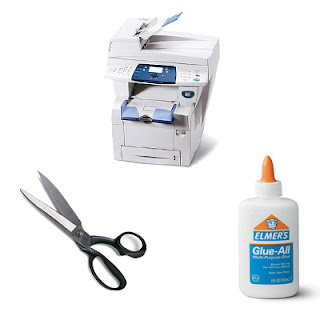 AH: You've had an exclusive behind-the-scenes view of the opposing parties of the Highgate Case. What have your experiences taught you about them? CF: Not to get involved with either party. I think that the whole Highgate nonsense came about through a hoax on both sides, both parties are as bad as each other as far as internet wars are concerned. They both use the Highgate case to make money, throw insults at each other especially family, friends, relatives, they both want to hurt and threaten all involved as much as they possibly can, it doesn’t matter to either/or if innocent people are involved with all of this. And to be honest it’s all so completely sad that this matter has been allowed to drag on 30/40 yrs down the line when both men are in their 60’s/70’s and should know better. AH: Do you believe any supernatural phenomena took place at Highgate? If so, what form did it take? CF: No I don’t believe that any kind of supernatural phenomena took place at Highgate, I think it was all mass hysteria at the time made no better by the public press making reports and then some crazy person organising a alleged ‘vampire hunt’ people making claims that they staked the ‘vampire’ and such forth. Where is the evidence? There is none , save from the two people who created this ‘legend’. AH: In light of your experiences, what advice would you give to other researchers, with an interest in the Case? CF: Don’t get personally involved with either party you will come to regret that you ever did. Keep your findings to yourself, don’t get involved in any message boards as you will become involved in a hate campaign. You will receive death threats, have your email accounts hacked into, have personal information found about you and such forth. I was told by Bishop Manchester’s group at the time that they even knew my National Insurance number and the very job centre that I used to visit at the time. The other party is just as bad for obtaining personal addresses and posting these in public so all can see also they publish private and personal correspondence to all and sundry and in booklet form, make ridicule of your religious believes if you have them and both make untrue stories about you. So take my advice and keep well clear of the lot of them. I'd like to thank Catherine for taking the time to answer my questions. The items on stalking and harassment are quite interesting and something I've experienced, myself. There's a reason I used to employ a pseudonym, afterall. Here's why I started using my actual name. 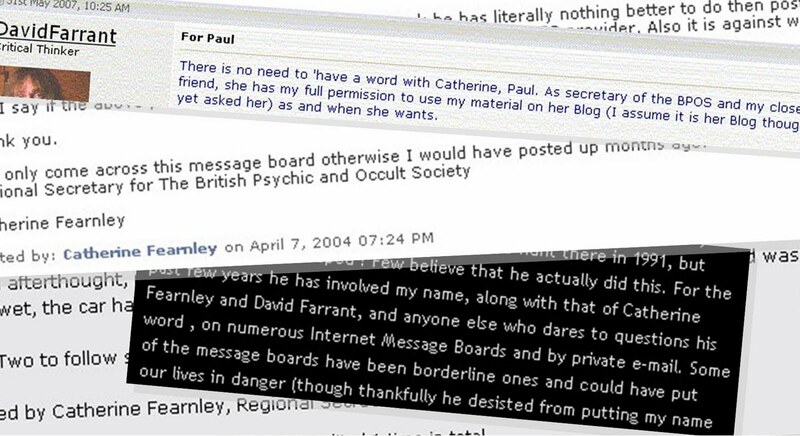 I've also previously covered the use of Catherine's name as a "front" for anti-Manchester writings. During the course of my discussions over at The Supernatural World forum, I took the opportunity to interview Barbara Green ("greenorchid") for her thoughts on the Highgate Vampire Case, and her interaction with the main parties behind it. She is the president and founder of the Yorkshire Robin Hood Society. Its current patron is David Farrant; a post formerly held by Seán Manchester. So how did she get mixed up in it all? I found out by sending her a list of questions via the forum ("Hi Barbara", 16 August 2010 - 03:36 AM), which she responded to ("Hi Barbara", 18 August 2010 - 03:05 AM). I've reconsituted them here in interview form, thus my (originally) numbered questions are replaced with my name and subsequent abbreviations and applied this same procedure to her responses. However, I've retained her upper case replies. Anthony Hogg: What drew your interest to the Highgate Vampire Case? How did you first hear about it? Barbara Green: I MET SM [Seán Manchester -ed.] AT THE BARNET CARNIVAL IN 1986. HE CALLED HIMSELF LORD MANCHESTER. I WAS THERE TO MEET JOHN POPE DE LOCKSLEY OF THE LONDON ROBIN HOOD CLUB. SM OFFERED TO BECOME PATRON OF THE YRHS---PLEASE NOTE OFFERED--NOT ASKED BY ME!!!! HE SOLD ME HIS BOOK THV [The Highgate Vampire -ed.]. AH: You were convinced enough of Sean Manchester's claims that you made him the Patron for your Yorkshire Robin Hood Society. On what grounds did you find him suitable for the role? BG: NO--YOUR ASSUMPTION ISNT QUITE CORRECT---WE NEEDED A PATRON-LADY ARMYTAGE HAD REFUSED. HE ASKED TO BE OUR PATRON. WE THOUGHT HE WAS A LORD AND DESCENDED FROM LOrD BYRON--AS HE CLAIMED.HE THEN TOLD ME ABOUT THE VAMPIRE STUFF. AH: At some point, your views on vampires changed. What caused you to disbelive in them? AH: Later on, you made acquaintance with David Farrant, Manchester's "adversary". How did you get into contact with him? BG: VIA SM'S INFO HE KEPT SENDING ME ABOUT DAVID. AH: Eventually, Manchester was replaced as the Patron of your Society, and Farrant substituted in his place. What did you feel that he could bring to the role? BG: IT WAS JUST HONORARY--BUT HE HAS BEEN VERY SUPPORTIVE WHEN NECESSARY AND HE DID THE EXORCISM!! AH: What are your thoughts on Farrant's claims of the "psychic entity with vampire-like characterisitics" alleged to haunt Highgate Cemetery? BG: I GUESS THATS WHAT HE SAW AND THE BEST WAY HE COULD DESCRIBE IT--you problem seems to be with him saying vampire like characteristics, but that is only a descriptive term, it doesnt mean he thought it was a vampire. AH: Did you ever become a member of any of the organisations associated with Manchester or Farrant? The Vampire Research Society? The British Psychic and Occult Society or the Highgate Vampire Society? 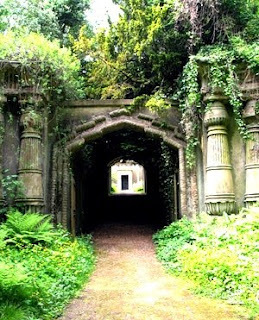 AH: Do you believe that any supernatural events took place at Highgate Cemetery? If so, what do you think the source of this manifestation was? BG: WHAT I BELIEVE IS NEITHER HERE NOR THERE, AS WITH KIRKLEES WE HAVE TO BELIEVE IT AS TOLD OR NOT BELIEVE IN THE SUPERNATURAL AT ALL; THERE WAS NO DOUBT A LOT OF DICKIPOGGY ALSO AND COMPETITION TO BE THE STAR OF THE SHOW; HOWEVER, I THINK GHOSTS ARE MORE "BELIEVABLE" AS THEY JUST FLOAT AROUND, WHEREAS A VAMPIRE HAS A PHYSICAL PRESENCE, LIVES INA COFFIN, BITES PEOPLE ETC--SO HAVE ALWAYS SAID THE DIFFUCLTIES ASSOSCIATED WITH VAMPIRES ROAMING AROUND JUST COULD NOT SUPPORT THEIR EXISTNCE.IF PEOPLE WERE DYING INEXPLICABLY FROM BLOOD LOSS ALL OVER THE PLACE, DOCTORS, CORONERS AND POLICE WOULD BE INVOLVED, NOT TO MENTION BEREAVED RELATIVES WHOSE COFFINS WERE VANDALISED. I'd like to thank Barbara for her participation. Just to clarify on a few things, though. The "Kirklees Story" mentioned is something I've previously covered. John Pope de Locksley's also been given a look-in. I've also touched on Manchester's Byronic claims. Lastly, the "exorcism" Barbara mentions, concerns a blessing ceremony held by David Farrant and Gareth J. Medway on the Kirklees estate, to dispell "malefic force reputed to haunt Robin Hood's Grave". In his response to the latest Mel Gibson scandal, the Bishop says "He is obviously something of an enigma; but, then, in some people's eyes, I daresay so am I." Unfortunately, this principle doesn't apply to the Bishop's plagiaristic activities. After all, it's pretty hard to be "mysterious" in the face of Google; a plagiarism-detector anyone can use. Time and time again, I've exposed him as a blatant plagiarist. Rather than admit it, he'll delete the incriminating post or turn nasty. Strange actions for a man of the cloth. Born in Peekskill, New York, Gibson moved with his parents to Sydney when he was twelve-years-old. He later studied acting at the Australian National Institute of Dramatic Art. Born in Peekskill, New York, Gibson moved with his parents to Sydney when he was 12 years old and later studied acting at the Australian National Institute of Dramatic Art. Gibson was raised a Traditionalist Catholic. When asked about the Catholic doctrine of Extra Ecclesiam nulla salus, Gibson replied: "There is no salvation for those outside the Church ... I believe it. Put it this way. My wife is a saint. She's a much better person than I am. Honestly. She's ... Episcopalian, Church of England. She prays, she believes in God, she knows Jesus, she believes in that stuff. And it's just not fair if she doesn't make it, she's better than I am. But that is a pronouncement from the chair. I go with it." When he was asked whether John 14: 6 is an intolerant position, he said that "through the merits of Jesus' sacrifice ... even people who don't know Jesus are able to be saved, but through Him." Acquaintance Father William Fulco has said that Gibson denies neither the Pope nor Vatican II. Gibson told Diane Sawyer that he believes non-Catholics and non-Christians can go to heaven. Gibson was raised a Traditionalist Catholic. When asked about the Catholic doctrine of "Extra Ecclesiam nulla salus", Gibson replied, "There is no salvation for those outside the Church ... I believe it. Put it this way. My wife is a saint. She's a much better person than I am. Honestly. She's... Episcopalian, Church of England. She prays, she believes in God, she knows Jesus, she believes in that stuff. And it's just not fair if she doesn't make it, she's better than I am. But that is a pronouncement from the chair. I go with it." When he was asked whether John 14:6 is an intolerant position, he said that "through the merits of Jesus' sacrifice... even people who don't know Jesus are able to be saved, but through him." Acquaintance Father William Fulco has said that Gibson denies neither the Pope nor Vatican II. Gibson told Diane Sawyer that he believes non-Catholics and non-Christians can go to heaven. You'll also find that the Bishop resorts to a lil Internet Theology 101 when discussing beliefs concerning the Virgin Mary as "co-redemptrix": portions of "his" writings have been taken from Wikipedia's "Co-Redemptrix" page. Mel Gibson's precise religious affiliation is obscure in most people's eyes. He once considered entering the Roman Catholic priesthood. He has described himself as "an old-fashioned Catholic," and has made speeches opposing abortion access, the use of contraceptives, and equal treatement and rights for homosexuals and lesbians as heterosexuals receive. Gibson experienced a spiritual crisis in the mid-1990s at the age of thirty-five. He told The New Yorker magazine: "I got to a desperate place ... And I just hit my knees. I had to use [Christ's] wounds to heal my wounds." During September 2002 he revealed that he no longer believed in the Roman Catholic Church as an institution, saying: "I agree with everyone who says the Vatican is a wolf in sheep's clothing." Gibson's precise religious affiliation is unclear. He once considered entering the Roman Catholic priesthood. He has described himself as "an old-fashioned Catholic." He has made speeches opposing abortion access, the use of contraceptives, and equal rights for gays and lesbians. He experienced a spiritual crisis in the mid 1990s at the age of 35. Gibson told The New Yorker magazine: "I got to a desperate place...And I just hit my knees. I had to use [Christ's] wounds to heal my wounds." During 2002-SEP, he revealed that he no longer believed in the Roman Catholic Church as an institution. He said: "I agree with everyone who says the Vatican is a wolf in sheep's clothing." In the midst of all this copy-n-pasting, the Bishop leaves room for some of his own scanty thoughts, and indicates, that, yes, there appears to be a conspiracy perpetuated against Gibson: "I regard him as a talented, albeit troubled, soul who might very well be facing a conspiracy to ruin his career since the making of The Passion of the Christ." Hmm, yes. I'm sure his career tailspin has nothing to do with alcoholism, anti-semetic and other racist remarks, oh, and those horrendeous leaked phone calls to his ex, Oksana Grigorieva. But I digress. A few pages back 'Vampire Researcher' was complaining that 'Man, Myth and Manchester' contained material that belonged to someone else's copyright. He did not mention that issues 6 and 7 of that booklet series drew attention to the fact that a certain biography of Lady Caroline Lamb was verbally almost identical to the two previous biographies of Lamb by Henry Blythe and Elizabeth Jenkins. Also, that a book about the 'Grail Church' contained almost nothing that was not to be previously found in various books about 'Celtic Christianity', such as those that were sold in the 1960s at Arnold Leese House in Notting Hill Gate. (The late Arnold Leese had been the author of 'Out of Step: Incidents in the two lives of an anti-Jewish camel doctor'; he fell out with Owsald Mosley, and nicknamed him 'The Kosher Fascist'.) These plagiarisms certainly violate other people's copyright. Hopefully the Bishop and his supporters will learn a lesson about leveling "copyright violation" charges against their opponents. If not, then they should turn to Matthew 7:3 for a reminder.